Rosé gets a lot of love for being the perfect summer drink. I can't argue with that, but I also appreciate it in the autumn months. I purchased my first bottle of rosé on a girl's trip to Napa, just when I started to learn that drinking pink wine wasn't something to be embarrassed by. Doug and I broke it open to enjoy on a late September evening and it tasted fantastic with the prosciutto and late summer melon. Since then, I've thought of rosé as my perfect summer-to-fall transition wine. It's cold and refreshing, but with more substance and depth than summer whites. Rosé also pairs well with some of my favorite fall dishes, including this sweet-tart salad. I've been on a huge fruit-in-salad kick - strawberries over arugula, watermelon cubes with feta, asian pears garnished with toasted pistachios - but this salad was the original. I'd never have imagined that slices of crisp granny smith apples belonged with diced celery. The tart taste of the apples is a surprisingly good match for the dry, vegetal flavor of the celery. The honey-mustard dressing sounds like a corporate dipping sauce, but this one reminds me why those flavors belonged together in the first place - sharp, bright, tangy. Below is a quick round-up of the rosés I've been enjoying recently. The salad recipe follows the wines. This light pink wine - a blend of Cinsault, Grenache, and Syrah - was dry and refreshing. Clear strawberry notes, but also strong mineral character. It was damn good with a Guadalajara Sour. This Cuatro Pasos is made with Mencia grapes from the Bierzo region of Spain. Mencia is similar to Cab Franc, so I expected to like it more than I did. Instead, this was a little too berry-rific for me. The fruit dominated the wine. Doug and I have a fondness for wines made from Chinon because they feature Cabernet Franc. This rosé is made entirely of Cab Franc; it's tart and citrusy, with an herbal scent on the nose. If the MiP is the most delicate of this crew, the Stella is the richest. The wine is made with Syrah grapes. It is full, food-friendly, and fantastic in the cooler months. We really loved this one. Whisk the first three ingredients in a small bowl to blend. Gradually whisk in oil. Season vinaigrette with salt and pepper. Thinly slice celery stalks on a deep diagonal. 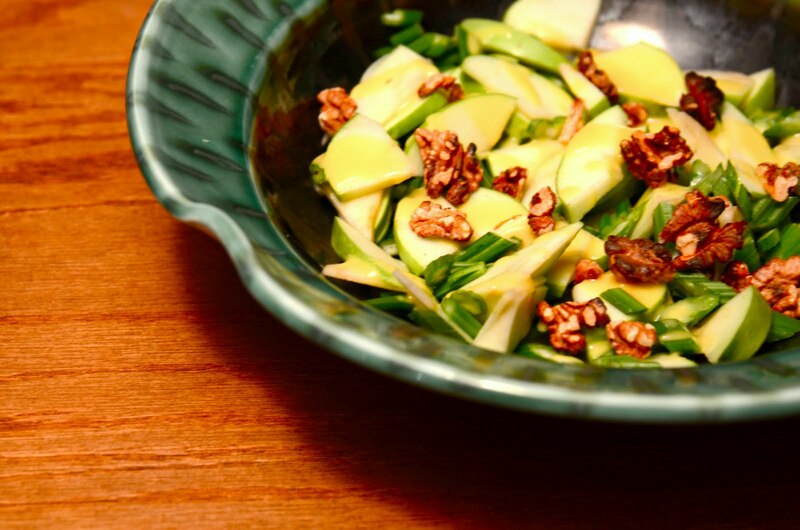 Combine celery, apple slices, and toasted walnuts in a large bowl. Add vinaigrette and toss to coat. Season salad to taste with salt and pepper.